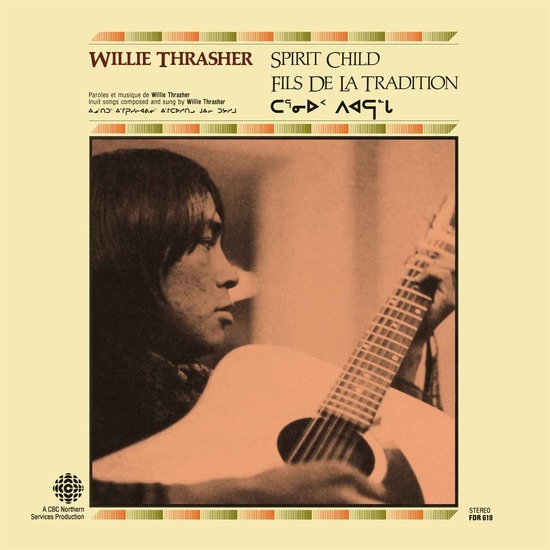 Willie Thrasher is a gifted Inuk singer and songwriter who lives in Nanaimo, British Columbia. In 2014, three of Thrasher’s earliest songs, appeared on the wondrous and revelatory Light in the Attic Records compilation, Native North America (Vol. 1): Aboriginal Folk, Rock, and Country 1966-1985, renewing interest in his and other Aboriginal artists’ work. On October 30, Thrasher’s powerful 1981 debut album. Spirit Child, was reissued by Light in the Attic, and here we discuss eating breakfast in Nanaimo, his 2009 album Asumatak – The Great Land, how life hasn’t changed that much since Willie was featured on the Native North America compilation, becoming known for something you made 40 years ago, as a kid, feeling young, WIllie’s nice voice, screaming and yelling and playing drums in the Cordells, Willie’s aggressive voice, performing not busking with his wife Linda, getting respect as an artist in Canada, the impact of contemporary publicity, Kevin Howes, Willie Mitchell, David Campbell, growing up, the residential school experience, being one of 21 children, discovering country music via a local radio station, A Hard Day’s Night and Ringo Starr, the Cordells, the mysterious man who changed his life by suggesting he get back in touch with his tradition, the song “Wolves Don’t Live by the Rules,” recording Inuit songs at the CBC in Montreal, leaving the Northwest Territories forever in 1970, living all across Canada in the ensuing years, WIllie’s style, how Spirit Child changed things for Willie, following up Spirit Child, firefighting, whaling, the significance of external respect for Aboriginal music, unity, Willie and Linda’s new songs, “Wolves Don’t Live by the Rules,” and that was it. Zaki Ibrahim is a very creative singer and songwriter who splits her time between Toronto and Johannesburg. Over the past decade, she has established herself as one of the most daring and fascinating R&B/electro-pop artists in North America and her heady, sci-fi-infused debut album, Every Opposite, was shortlisted for the 2013 Polaris Music Prize. This Sunday June 8, Ibrahim performs at the Field Trip festival at Fort York in Toronto along with people like Constantines, Fucked Up, Washed Out, Do Make Say Think, Gord Downie and the Sadies, Broken Social Scene and more. A few months ago, Ibrahim and I caught up for a chat just after she played a noon hour concert at the University of Guelph where we discussed microphone checking, our hang-ups about our voices, speaking like someone who’s lived in South Africa and Canada, being mistaken for Jian Ghomeshi on the phone, playing concerts for students at lunch, leading an aerobics class, the sci-fi, African-set narrative of Every Opposite, Nanaimo to Cape Town, the town in British Columbia that has outlawed hand drumming, Diana Krall and Young Galaxy, rumbling tummies, receiving a Polaris Music Prize nomination, getting to Toronto in 2001, living in Johannesburg, deer come, Zaki’s dad was involved with Bush Radio and media education in Cape Town, making radio plays but not necessarily engaging with other media forms, House of Lies with Don Cheadle and Teen Wolf, the internet in South Africa, twitter binges, avoiding categorization musically or otherwise, knowing one’s blackness and being multi-racial or “Canadian,” I subtly quote the Fugazi song “Place Position,” loving pop music by white people, singer and songwriter, being ok with external perceptions of one’s work, performing for old people at lunch, dates, following up on Every Opposite, messing with songwriting and addressing the terms of success, go to wikipedia, proper pronunciation, and that’s it.